RB and Todd Michael Kiech at ACDF circa 1987. Oh, the 80s. Picture it. 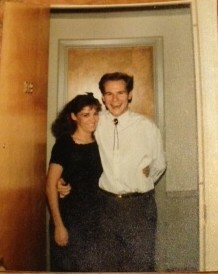 Central Illinois – 1986 – a girl from Decatur meets a guy from the Chicago suburbs at a dance rehearsal. There is laughing, lots of laughing. A friendship is born amid leotards and leg warmers. Todd Kiech is many things: a dancer, choreographer, teacher, actor, psychic, burlesque star, bartender, but most of all he’s my dear friend. He has the most infectious, boisterous laugh around. He makes me giggle every time I see him. He’s my original peep. We’ve done hundreds of shows together over the years. I will never forget the sage advice he once gave me in rehearsal. 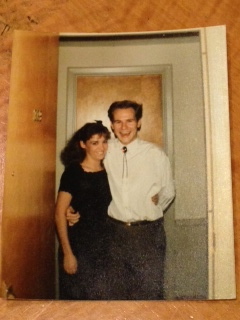 “Vicki, do…something!” Back in the day, I had big hair and he had hair. I love my Todd Kiech. Happy 27 years, my friend. This entry was posted in anniversary, dance, rogueness, Throwback Thursday, Todd Keich by Vicki. Bookmark the permalink.